The results declared on 29th May, 2018 proved that students have stood true to the School’s motto ‘Strive Harder, Soar Higher’. 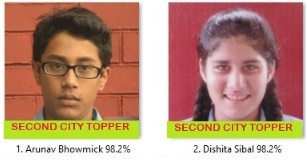 Aashna Chopra, the CPS AB topper who is also the VIDARBHA TOPPER scored 98.6%.Arunav Bhowmick & Dishita Sibal both are joint 2nd city toppers with 98.2%. Amisha Kelkar of class XII,from the Science Stream is the City topper with 97.8% having scored the highest percentage in English, Mathematics, Physics, Chemistry & Physical Education..